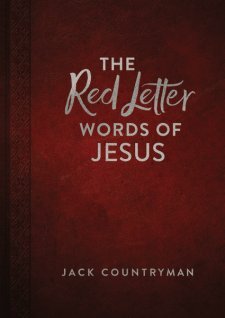 The Red Letter Words of Jesus By Jack Countryman Published by Thomas Nelson is a beautifully bound pocket sized book highlighting selected scripture verses from Jesus' words in the new testament. Unlike other devotional books- this small volume focuses on the words of Jesus. Each selected verse is one of Jesus' words from the new testament. The title "Red Letter Words of Jesus" is based on the concept that many bibles specifically print the words of Jesus in red colored font to distinguish from the reminder of scripture. Each two page devotional spread features a beautifully illustrated verse- is red type font, along side a short devotional passage written by the author, Jack Countryman. If you are looking for a new devotional that will lead you back to the spiritual basics, this book is a good choice. This book would also make a beautiful gift as well. As a blogger for booklook I received a copy of this book for the purpose of writing this review. This book is published by Countryman, a division of Thomas Nelson publishers.